← It’s Only Original Once! 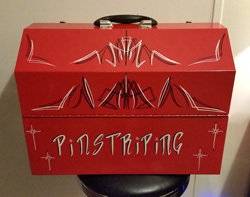 Pinstriping: Old School Craftsmanship Is Still Alive And Well! 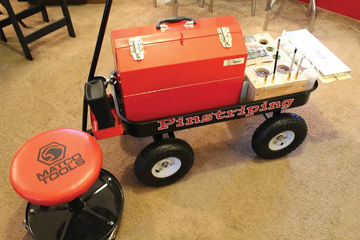 The art of freehand pinstriping can be traced back as far as the Roman Empire. Freehand pinstriping was used to accentuate the lines of the horse drawn carriage in the 1800s, and to detail the curves and bodylines of early American automobiles in the 1900s. Since the 1950s, such visionaries as K Von Dutch (Kenny Howard), George Barris and Bob Bonds have depended on freehand pinstriping to not just add color and flash to their creations, but bring them to life. Of course, technology has been utilized to duplicate with tape stripes, stencil stripes and mechanical wheel tools, but where they all fail miserably is the inability to duplicate the love, passion, flair and dedication that only a skilled artist can convey. Showing not only love and passion, but a dedication to be the best, my friend Billie has always been a talented artist, drawing ’40s and ’50s style pin-up style models as early as elementary school. So what sets Billie apart from everybody else at the car show or swap meet? First you see the long blonde hair and “cat eye” sunglasses, oh yeah, and she’s a very successful artist in a male-dominated art form. 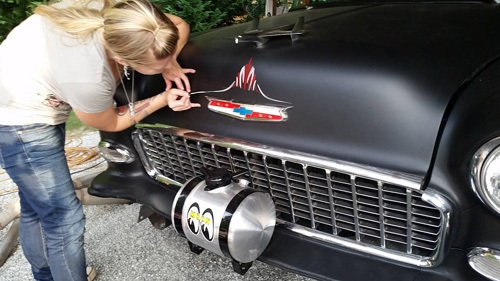 Billie was looking for a way to combine her love of art and cars, and discovered the answer when she saw a pinstriping kit in a Mooneyes catalog. With a fiery passion and learning from some of the best freehand pinstripe artists, she has her own company–Rockin’ Billie’s. She derived that name as a twist on her favorite style of music that’s a lifestyle unto itself– rockabilly music. Everyone has that go-to wrench, screwdriver, or air gun in the toolbox, and Billie is no exception. Her main brushes are a 00 Mack Sword Striper and Mack size 1. Billie recently acquired two Von Dago brushes directly from Von Dago himself (Jeff Scozzaro), a 00 and 0000. She uses these brushes when creating very fine lines or anything requiring precision detail. 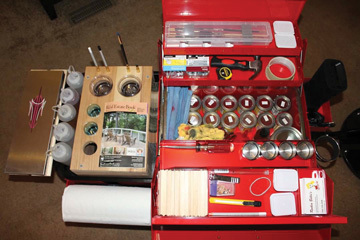 For color, she uses 1-Shot lettering enamel, and will use stock colors, but if a customer wants a truly custom touch, or if the job calls for it, she will mix and match colors. Sometimes, straying from the norm to create a one-of-a-kind piece of artwork is what the job calls for.